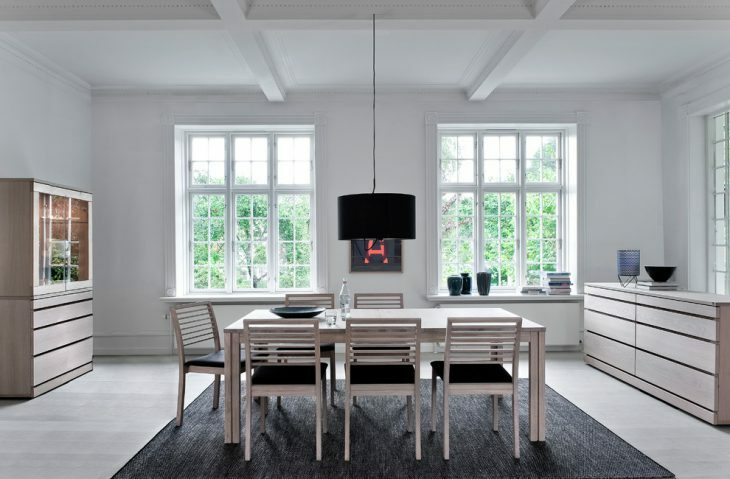 Scandinavian design is basically simple, yet elegant. It incorporates the use of natural materials like wood, hemp, and leather. Functionality, durability, minimalism, and reliability are the main values of this specific design. Of course, some colors here and there will not hurt. 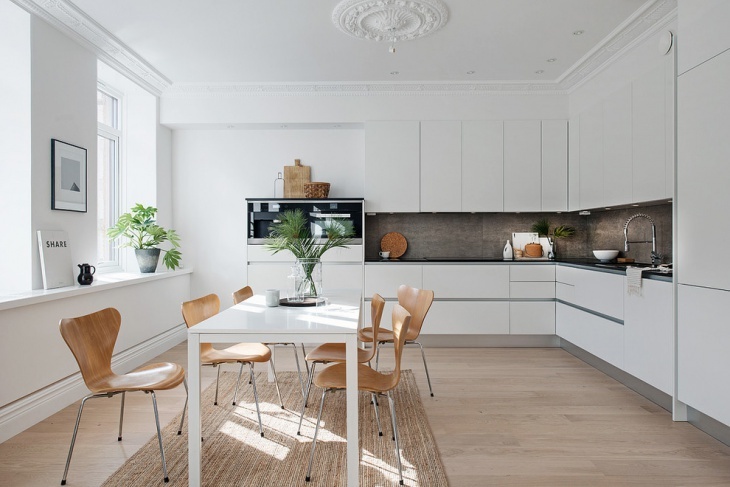 But essentially, if you want something simple and functional in your home interior design (especially in the dining area), Scandinavian design is your best bet. 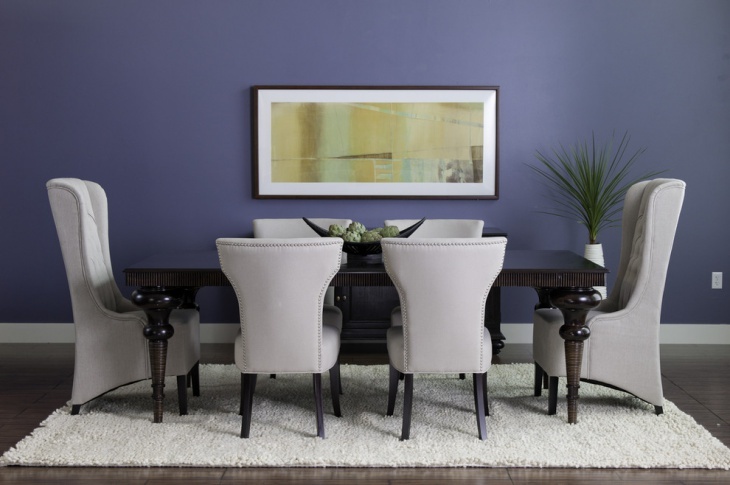 Blue is a cool color and it can be a nice motif for a dining room. For this specific dining arrangement, the coolness of the blue wall is enhanced by the simple abstract artwork. 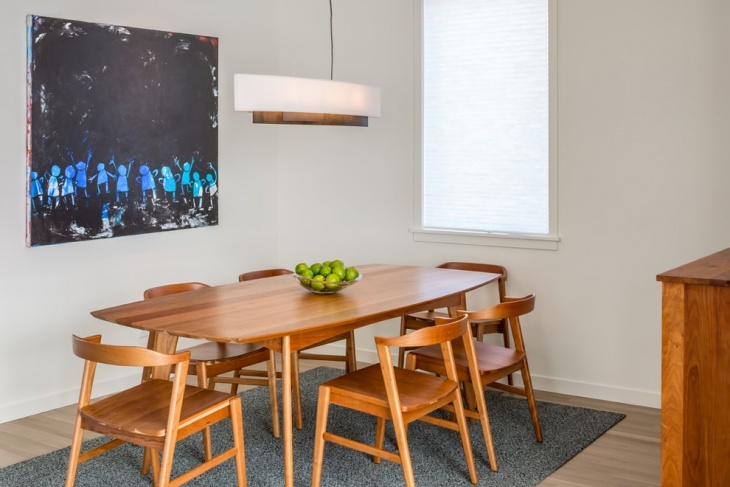 The thick white rug provides a nice contrast to the dark wooden flooring, while the electric dark wooden dining table is paired with six upholstered chairs – two of which are the tufted end and placed strategically on the heads of the table. 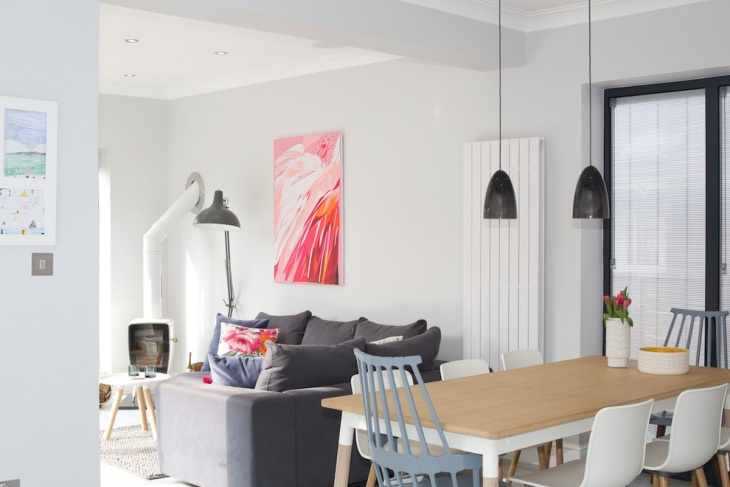 This dining/kitchen area has a true Scandinavian spirit written all over it. 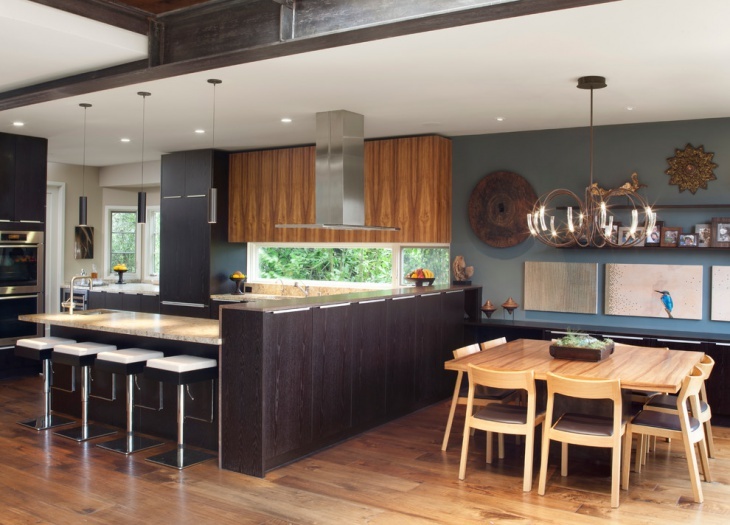 The idea of easy transition between kitchen to dining is truly functional. 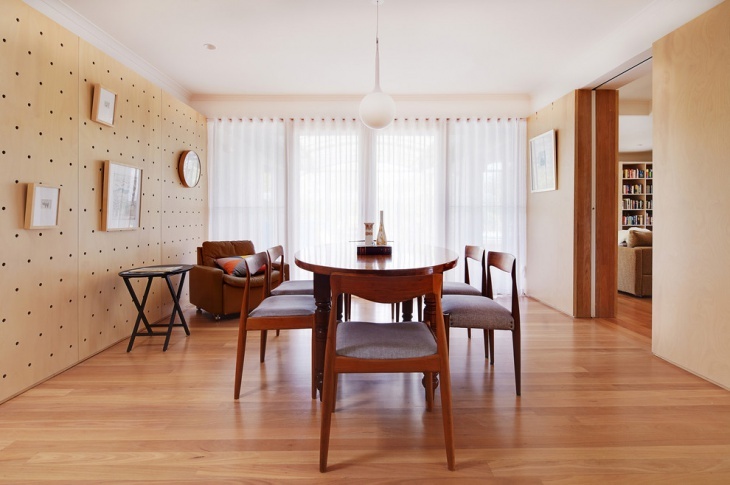 The use of unpolished wooden table and chairs defines simplicity. 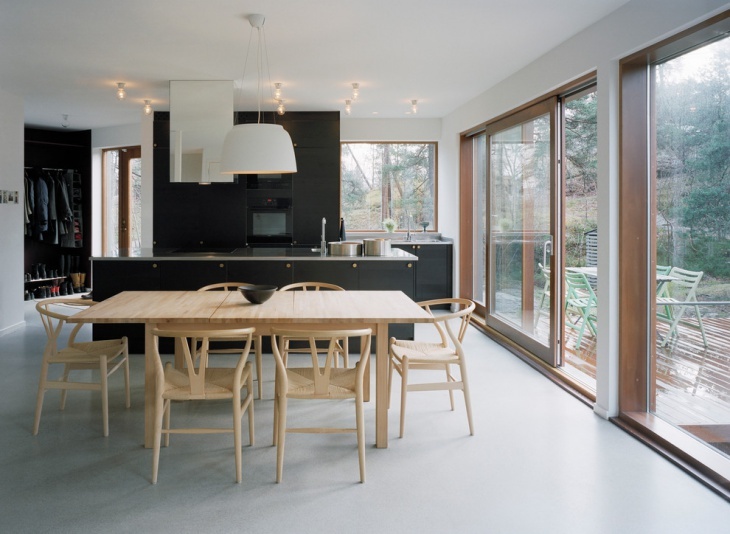 The black motif in the kitchen provides a nice balance to the whiteness of the dining area. The glass sliding door, glass windows and glass walls provide natural light and the scenic view of the porch and the garden. 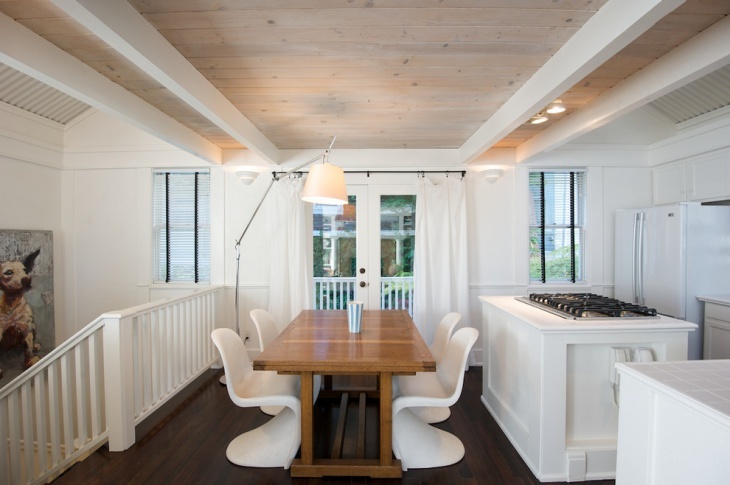 This white painted dining area is a delight to look at. Even the whiteness of the two framed artworks did not dampen the beauty of the overall design. The dark wooden table and the six side chairs provide the much-needed contrast to the whiteness of everything else – these include the two head upholstered head chairs, the souk rug. 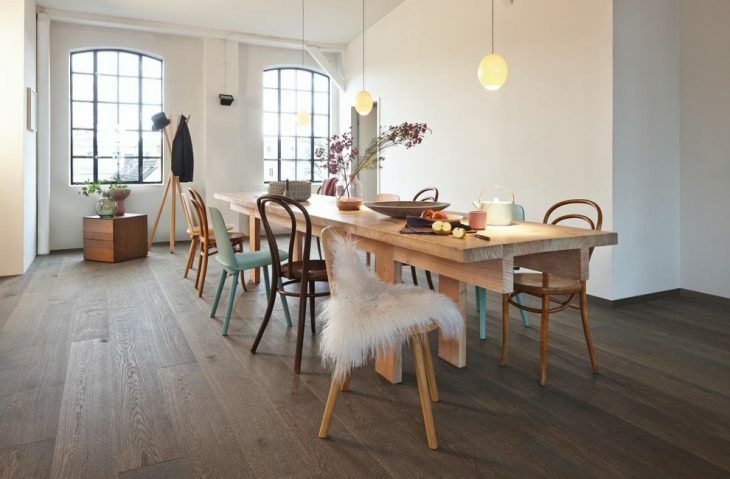 Since Scandinavian designs are all about simplicity and functionality, this dining area is a perfect example. The ceiling and the walls are painted white and matched by the white flooring. 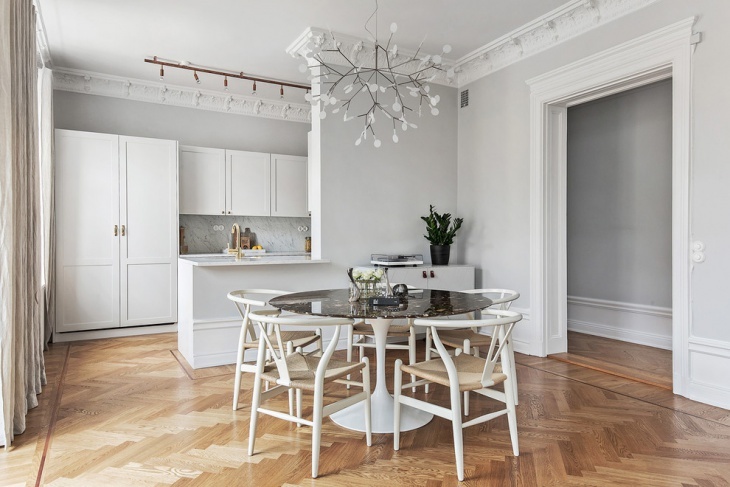 Even the cabinets are done in white, and the small artwork (set on the wall between the two windows), the chair seats and the bits and pieces of ornaments are the only features that provide a bit of darkness among the whiteness. A trendy look can be achieved in coordination with the simplicity of the Scandinavian design. 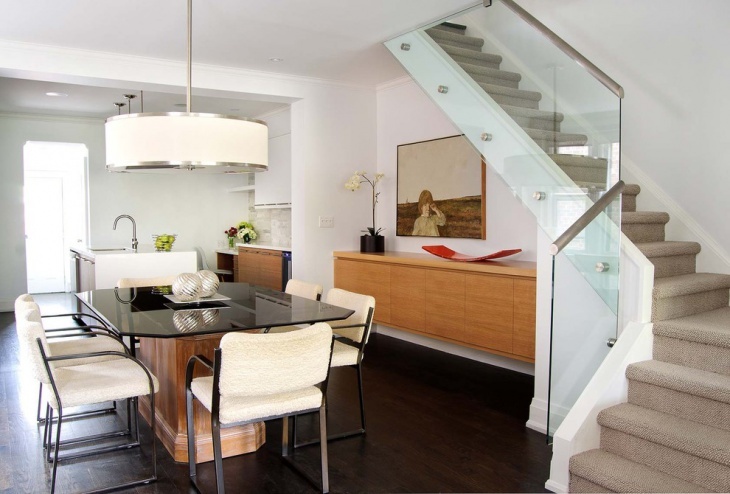 For this kitchen, the contemporary look of the dining chairs effectively provides contrast to the simplicity of the rectangular dining table. Everything is in white – from the ceiling to the walls to the floor and even to the adjoining kitchen. Truly simple and functional, with just the most required items on board. The round glass topped dining table is a perfect furniture for this design as it displays simplicity at its finest. The matching four metal framed chairs add elegance into the set. The slightly dark wooden floor is the only thing that provides contrast to this otherwise all-white dining to the kitchen set up. Colors are not against the rules of Scandinavian designing. 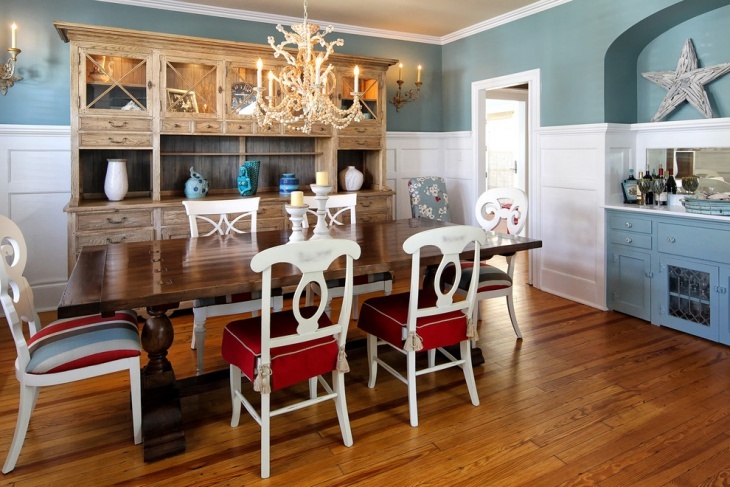 For this dining area, color against white is provided by the dark wooden oval shaped dining table, some chairs, the small artwork on the wall and the wheeled storage. The glass wall provides a nice backdrop for this white dining area. Black glass topped dining table is matched perfectly by gray dining chairs – all set over the simple light gray rug. 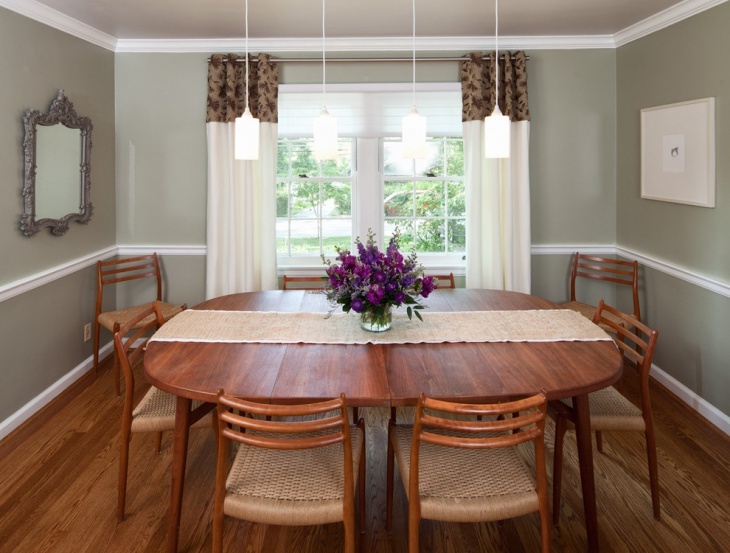 Some elegance and class are added to this Scandinavian design dining room. The walls have the nice combination of white and blue, and the unpolished wooden cabinet provides the simple functionality feature. The vintage look is achieved with the use of the antique chandelier and wall lightings, as well as the dining set. A rustic look for a Scandinavian designed kitchen? Why not. 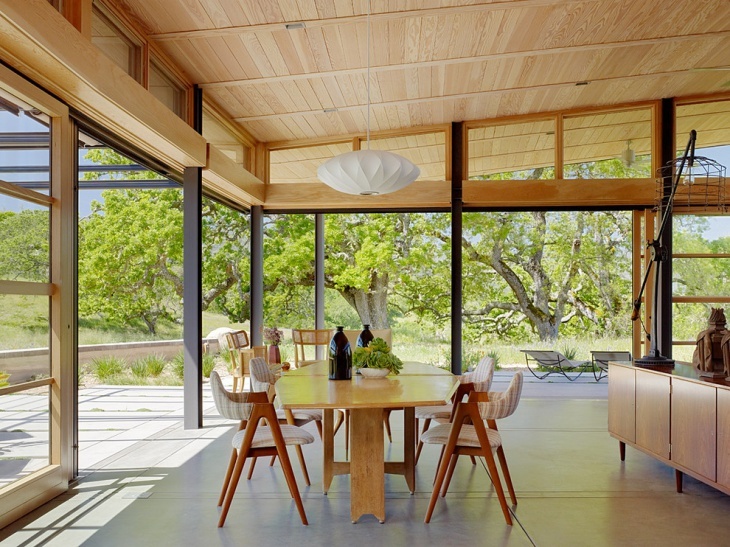 Aside from the natural scenery from the outside that can be seen through the glass wall, this dining area also has rustic looking wooden dining table matched effectively by rather modern dining chairs.